The LZ1AQ Loop Amplifier looks like a stable solution for my wideband magnetic loop project. Time to test a prototype on a breadboard. After less than satisfactory results with my original transimpedance amplifier design, I decided to try the popular LZ1AQ Loop Amplifier. Chavdar Levkov sells a commercial version of this unit, but has also made a simplified design available for hobbyists. Here is a complete description and schematic. 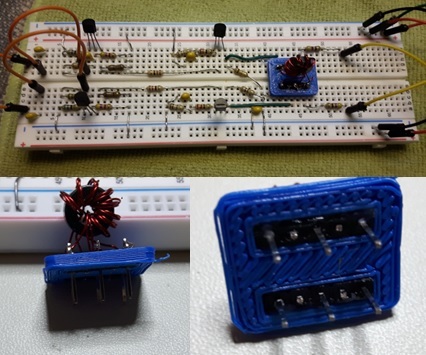 Chavdar’s LZ1AQ Loop Amplifier is a fairly simple design. He designed it as a common base amplifier with a common emitter follower in a balanced configuration. His circuit uses 2N2222 NPN transistors. My LTSpice modeling shows good performance with lots of gain potential and good dynamic range. I simulated two versions. First, the original design running off 10 VDC. Second, a 5 volt version with reduced gain to serve as a replacement for my original Head End amplifier design. Both worked on paper. Time to test these circuits on a breadboard before jumping to PCB design. I know that using a breadboard for RF amplifiers is prone to problems, but good enough for a first cut. On the breadboard, the LZ1AQ loop amplifier works well at lower frequencies, but gain drops off substantially above 10 MHz. Since breadboards add tons of stray capacitance, perfection is elusive. Having satisfied myself about basic performance and stability, I will now move on to fabricating a PCB. Again, I will try surface mount components. The LZ1AQ loop amplifier uses an output transformer, easily made using 8 trifilar windings on a ferrite core. My experience has shown that these things with their thin magnet wire construction can be hard to mount. So, I though I would design a mounting jig using my 3D printer and pin headers. As you see in the picture above, I used a 20 mm square base with slots to hold a small strip of breakaway pin headers. Pin spacing is 0.1″ with two rows 0.3″ apart – standard DIP spacing. I added some Super Glue to firmly bond the headers to the PLA plastic. My plastic jig works well on the breadboard, and can also be used to mount the transformer on a PCB.